Italy is one of my favourite countries in the world, and probably the country where I've visited the most towns and cities. Italy isn't a cheap country to backpack around, as it’s in the heart of Europe, but it has a lot to offer. Think museums, art galleries, fantastic food and beautiful scenery. The nation really does have it all, and it is obvious why it is often declared one of the most romantic countries in the world. I’m going to highlight a few of the places I've been to, and what essentially would make a good backpacking trip. Rome is a good place to start and very accessible to get to. Rome wasn't built in a day; and it certainly can’t be covered in one either. You could easily spend a week in the city and still have so much to see, however as us backpackers never have enough time, I’d recommend 3-4 days in the Italian capital. The main sites in Rome are fairly well known but here are my recommendations. Firstly, take a trip to St Peters Basicilia and the Vatican City, then you can tick going to the smallest country in the world off your list. Then of course visit the Colosseum, which is awe inspiring. The actual insides of the Colosseum were pretty disappointing in my eyes. At the naive age of 15, when I visited, I expected the whole arena to be up and running with actors playing out Gladiator scenes, but this wasn't the case. Quite run down inside but still a lot to see and experience. Further, explore the sites of the Pantheon, the Piazza del Popolo and the Trevi Fountain to make a wish! The sites can take up most of your time in Rome, but don’t forget to stop in a busy Piazza to try local stone baked pizza and fresh pasta. Florence is the next venture of my trip, and also a packed city just like Rome. 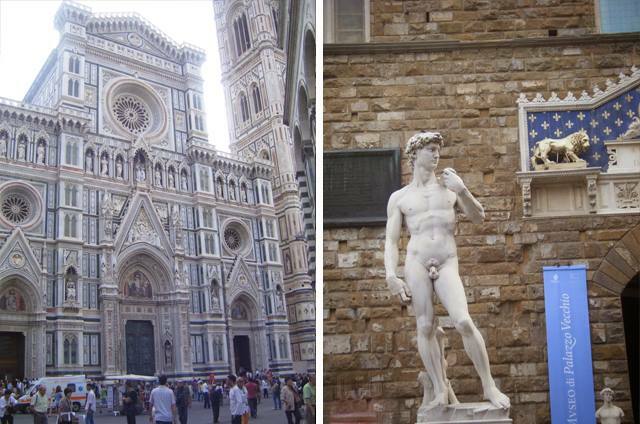 Florence is more accessible than Rome for walking around and seeing the main sites. The city is surrounded by art galleries, tiny streets with tall buildings and fantastic gardens. Your Florence itinerary can be jam-packed if art galleries are on your agenda, with places such as the Uffizi Gallery to see the Madonna and Child, or the Galleria dell'Accademia to see Michael Angelo’s original David. Although these sights are once in a lifetime visits, they might not be top of the list for everyone. If you're not an arty person, then don’t waste your time wandering around the Uffizi just because it’s there. Further sites you could be visiting are the Duomo, which is a magnificent cathedral in the heart of the city (and free to get in) and other less arty sites such as the Palazzo Pitti, a beautiful palace with a costume museum with great surrounding gardens to relax in and stare at the local Italian boys. A good way to also spend your time in Florence is to sample every flavour of gelato you can get your mits on. The more I hear about Pisa, the more disappointing it sounds. I've never visited myself but I have many friends and relatives that have been. Apparently, the Leaning Tower doesn't even lean that much, and there is a building near it with more of a tilt. I'm told that there isn't a great deal to do in Pisa apart from snapping the famous pic of pushing the Leaning Tower, or people watching in Piazza dei Miracoli. However, the city is fairly close to Florence so maybe worth a day stopover if you have the time. 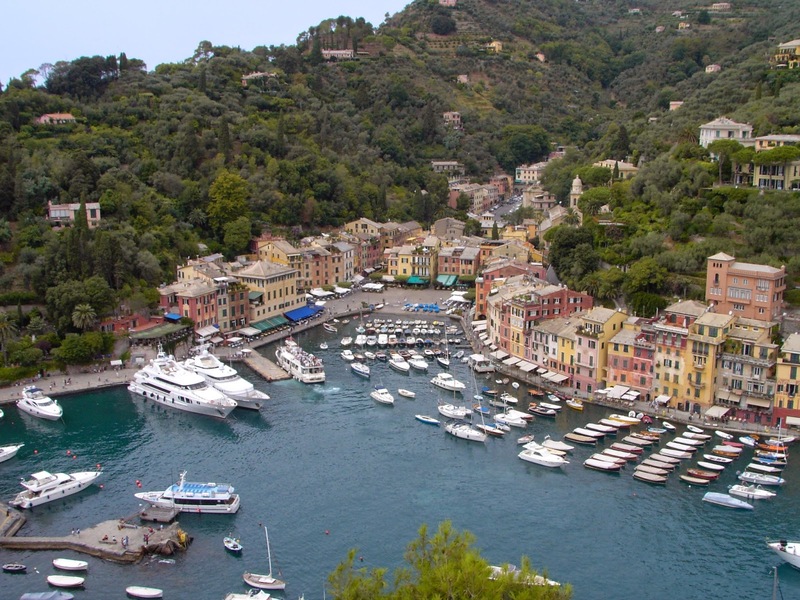 Portofino is a small coastal town on the west coast of Italy with a lot to offer. I went to Portofino when I was 15 as part of a two part day trip which also included the nearby city of Genoa. Portofino is a luxurious and expensive place to live, at the time a house cost €600,000 for each window it had. The town also famously hosts Dolce and Gabanna’s house, illustrating just how exclusive this resort is. Walking around the town is a sight within itself. Wander around and gawp at the quality of life, however also take a stroll to the Abbazia della Cervara to see some beautiful gardens and amazing views of the townspeople yachts. Secondly, try a wine and cheese taster just near the gardens and see the photos of famous visitors of the town, including Greta Garbo, Marilyn Monroe and JFK. Genoa is right next to Portofino; and in my opinion I say the two places are worth a few days stop off to explore a slice of rich Italian life. Genoa is much busier than Portofino, and definitely more of a tourist town with a larger array of yachts, designer shops and restaurants. A perfect way to spend your time here is to trail around the little Italian streets and markets to meet the locals and find some bargains. The town really gives you an insight to old and new Italy, both in the maritime sense and the suburban sense. Milan is known for being a fashion capital and an exclusive designer city. However, friends and family who have visited Milan have disagreed. I've only stopped over in Milan train station so I cannot vouch for my friends opinions, however I heard many say that Milan wasn't worth a few days of my interrailing trip, hence why I've never been. But, if you have the time and you’re really exploring Italian life, then take a day or two to stop here. Milan does have its grungy side, arguably just like any city, but it also has an appeal with its high fashion malls and its football status. If visiting the city, then spend some time looking at the many art galleries, and even football museums, or if you book months in advance then visit the creation of The Last Supper. Venice is one of my favourite cities in Europe, but also quite a claustrophobic city. The city can seem quite daunting if alone as the narrow streets and tall buildings can make anyone feel lost and feel like they are walking around in circles. However, once in the open squares, such as the famous Piazza San Marco, or the markets by the main canals, then Venice can really be seen as one of the most beautiful places in the world. If you have the money, take a gondola ride to really get the Venice experience. Then grab a slice of pizza from an open-windowed shop, which is fairly cheap and some of the finest pizza I have ever tasted. Furthermore, have a glass of wine in Piazza San Marco and watch local musicians play as if in a romantic Italian film. Venice may sound quite airy fairy, but it really is a fantastic city to be a backpacker in. There is a great deal to see in the centre including marble churches, contemporary art galleries and palace ballrooms, but you can also take a boat taxi to the lido beaches of nearby towns, which is where I experienced the Venice Film Festival. Venice is a must see in Italy, and I’d say the main place to see if traveling through this exciting and fascinating country.